Ammonia is simple but effective cleaner that can be a good addition to your dishwashing routine. 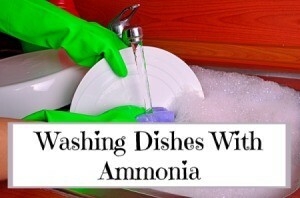 This is a guide about washing dishes with ammonia. When you start to wash dishes by hand, plug the sink (of course, LOL) and start the hot water. Fill the sink only halfway up (or less) and squirt dish detergent in the sink. Then pour a couple of ounces of ammonia into the sink. Sounds crazy, right? But you will find you have the richest, soapiest abundance of soapsuds you have ever had! At that dilution, the smell isn't noticeable, but the ammonia does the scrubbing for you. I don't care what it is; dried egg yolk, dried stuck on spaghetti, doesn't matter. Put the plates in the sink one at a time, letting each one get wet, and then the forks and spoons, etc., off to one side. By the time you get the rest of the table cleaned off and wiped and the water is cooled enough to put your hand in, just wipe the plates with the sponge. Repeat this process with glasses and cups, letting them sit in the sink while you rinse the plates, and they will sparkle when they are rinsed! Pots and pans are so much easier to clean with the ammonia in the water, too. I can't remember the last time I had to really scrub anything. The soapy ammonia water is great for washing the cutting blade of your electric can opener or getting a shiny, squeaky clean coffeepot carafe. When wiping down the stove top, if something is cooked on, lay a rag over it and dampen the rag with a little of your ammonia dishwater and let it set for a few. Then wipe it up, easy as you please. Same for wiping down the toaster, can opener, food processor, etc. Just be sure to go back over them with another rag wet with just clean water. You can also pour a little ammonia in your dishwasher at the beginning of the wash cycle; the dishes get SO much cleaner. Note: Do not, DO NOT use bleach or Comet or Ajax or anything else with chlorine in it, to clean, while you are using the ammonia! If you want to bleach anything, do that with water without ammonia. And a bonus reminder; mix your shampoo roughly half and half with vinegar; richer suds, cleaner hair, lots less cost. Can you use ammonia in dish washing liquid? Hi Clyde. If you mean a bit of dish detergent in a pail of water for cleaning the floor, yes. But make sure the dish soap is for hand washing and read the product usage directions on both products. Make sure the dish soap does NOT contain any kind of bleach or chlorine products in it. You never want to mix ammonia with bleach as it will combine to make poisonous fumes. Ammonia is pretty nasty stuff anyway. I would use something else. Yes, you certainly can ... the more expensive Dawn dish detergent has ammonia in it! Use a cheaper brand and add your own ammonia, much cheaper. How much, start with an amount you think appropriate for the size of the container. You can always increase or decrease the amounts.